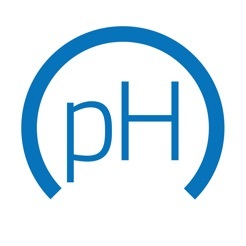 The Hanna Lab App turns an iPad, iPhone or iPod touch into a full-featured pH meter when used with a Hanna Instruments HALO™ pH probe with Bluetooth® Smart technology. The Hanna Lab App includes a Demo mode showing all the features of the app. 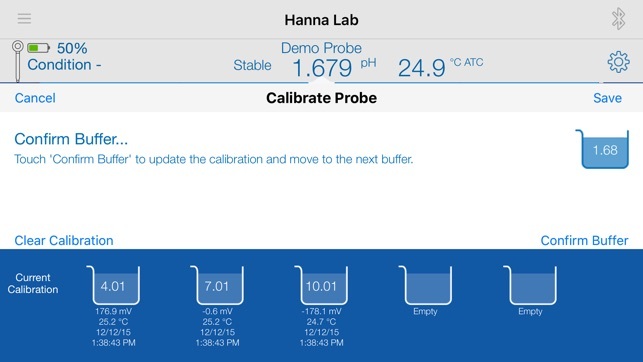 The Hanna Lab App provides a display of the current pH measurement, solution temperature and mV reading as well as a graphical plot or tabulated record of measured data over time. 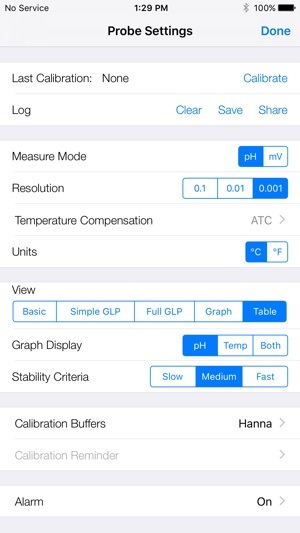 The app also features built-in help, probe calibration, manual or interval data logging, data sharing, and alarms when the readings are outside user-defined limits. 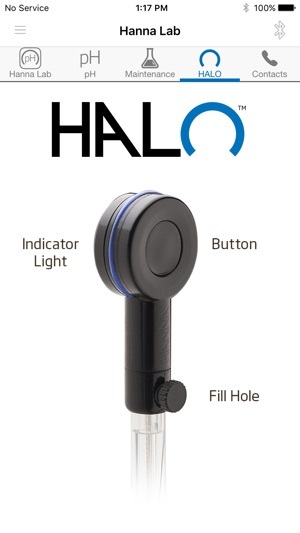 The HALO™ probe’s Bluetooth® Smart technology offers many advantages in wireless measurement convenience and the probe can be used up to 10 meters (33 feet) from the iOS device. 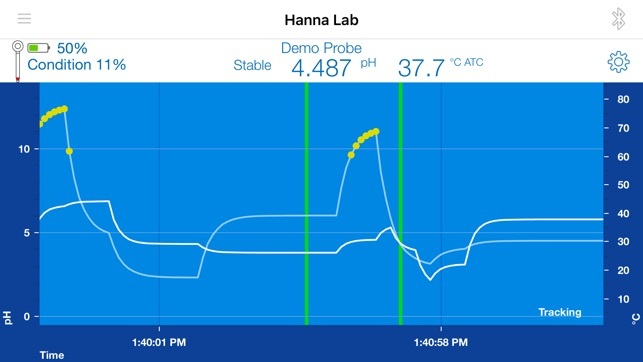 The HALO™ probe and Hanna Lab App are ideal for professionals and educators needing accurate wireless measurements in the laboratory, classroom and in the field. I’ve been using the app for about a year and it’s remarkable! 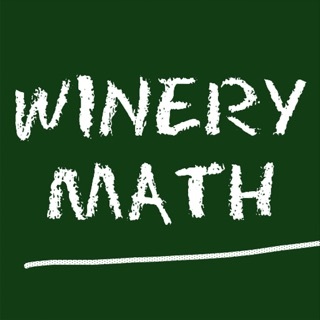 Calibration is quick and I find it easy to read. I do wish that there were a few more customization options regarding data logging and calibration slope display. I’ve been using this app for about nine months. It has worked well although it is always been finicky connecting to the probe via the app. Sometimes it would connect automatically, other times I would have to reestablish the connection manually. Now I can’t get it to connect at all which means I can’t measure pH in my brewery. I have had my Foodcare Halo since they released it, and I have nothing but positive things to say...(to the guy 1 staring this - dude, you don't have to give the app a 1 star because you received a damaged meter. It was most likely UPS, so before you go giving terrible reviews why don't you call the service center. They have been very helpful to me, especially when I broke my first electrode they sent a replacement free of charge). It is an accurate meter, affordable, and the app for my iPad mini runs very smooth. I love that it stays accurate over many uses. I mean, the ability to save calibration is very nice. I've also done data logging with the app, and it is awesome to be able to download the data points to a csv file and create a curve in Excel. It's a jaw dropper in the kitchen when I get the Bluetooth meter out and link it to my iPad. It's awesome to get such a response to the equipment! © 2014-2017 Hanna Instruments, Inc.